Pancreatic surgery is technically complex. The incidence of postoperative complications after partial or total resection of the pancreas is greater than in other abdominal surgeries, and remained constant over the last years, at 35%-50%. In contrast, recent data indicate a substantial reduction of postoperative mortality (currently below 2%). A strong volume-outcome correlation has been demonstrated in pancreatic surgery. In 2002, Dr. Birkmeyer published in the New England Journal of Medicine the results of a large observational study that included 2.5 millions operations in different surgical specialties, performed in the United States between 1994 and 1999. Mortality after pancreaticoduodenectomy was 16.3% in low-volume institutions, and 3.8% in high-volume institutions. The absolute difference in mortality between low-volume and high-volume institutions (12.5 points) was the greatest, as shown in figure 1. Similar findings were published in 2008 by Dr. Balzano. 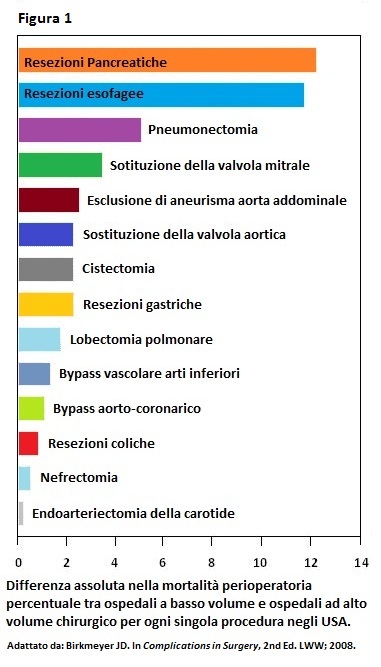 The outcome analysis of 1576 pancreaticoduodenectomies performed in Italy revealed that mortality was significantly lower in very high-volume institutions as compared with the other medium and low-volume centres (figure 2). This data was confirmed in a sample of 6570 pancreatic resections performed in Italy between 2010 and 2012. In very high-volume centers (those performing more than 90 resections/year) the mean mortality rate was 3.8%, significantly lower than smaller centers. Since 1990, more than 3000 pancreaticoduodenectomies have been carried out at the Verona pancreas unit (figure 3). The overall amount of pancreatic resections exceeds 4000, thus making our unit the biggest in Italy and one of the leading institutions worldwide. 30-day mortality rate after pancreatic resections is currently around 2.5%. On the basis of these results, the Italian Ministry of Health set a minimum treshold of 30 pancreaticoduodenectomies/year for high-volume centers and a treshold of 100 pancreaticoduodenectomies/year for centers of excellence. Centers of excellence should also set up a multidisciplinary team, a basic science research program, and a dedicated tissue bank. The Verona Pancreas Institute, the first interdisciplinary center of excellence for the diagnosis and therapy of pancreatic diseases, is committed to provide care based on professionalism, experience, and scientific evidence.